Ibiza is ever popular as a wedding venue and having your ceremony in an Ibiza villa makes for a wonderful setting. Interest in choosing Ibiza as a location for a wedding celebration remains high for many: the island is reputedly amongst some of the most popular places in Europe to say the words 'I do'. Hiring a villa can mean an intimate ceremony for just you and some close friends to a big celebration with lots of guests. When your villa is your wedding venue, you'll save on the cost of hiring a separate venue. With flights, transfers and all the wedding expenses to consider, this could be a great bonus. In most cases you will need to have an official wedding to get your actual marriage license, which is usually done in the bride and groom's home country. It is possible to get married on the island; however, most opt for a cool Ibiza wedding celebration. You will usually need to check that the villa you select accepts bookings for weddings and how many guests are allowed. The next step then is to choose your ideal villa. You can start by looking at our selection of villas for weddings, which frequently hold this type of special event. 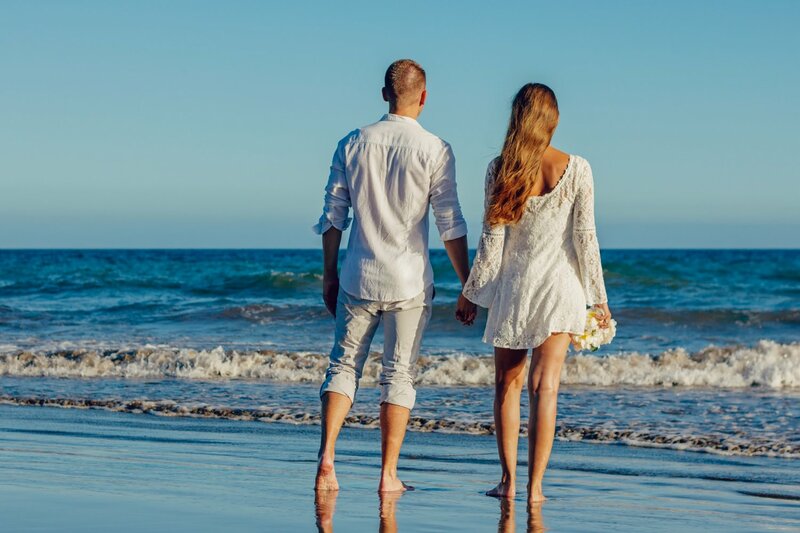 If nothing there appeals to you, style or budget wise, then browse through our wide range of villas to find the perfect spot for your romantic White Isle wedding. Once selected, you will need to click the link to Booking.com on the specific villa page and select the "contact the host" button, from where you will be able to get in touch with the villa owner or management to ask if you can use it for your wedding event. When you contact the host, be clear on how many people you want to invite and provide an outline of what you will be doing on the day - some villas are only licensed to host the maximum number of people that a villa sleeps. Note that villas often levy an additional charge for wedding events in most cases. If you plan on making a lot of noise, note that there is a noise curfew at midnight. You could of course head for the bright lights of Ibiza and go to a super-club, so consider this when looking at location. You will most likely want to engage the services of a wedding planner such as Ibiza Service Center so you have someone on the ground to handle all eventualities. Finally, it's likely that all your guests will not be staying at the villa you choose, so you might want to look into renting an additional villa or you can select a hotel from our hand picked selection. On Ibiza Spotlight's villa pages, you can choose by location, such as a specific resort, villas in the Ibiza countryside or ones near the beach. Many like to have their photos taken next to the sea, so the latter option could be for you. Some might prefer the splendid isolation of a rural villa. You will be able to quickly see, via the photo galleries on each villa page, the style of the property, with everything from sparkling minamalist decor or rustic Ibicenco charm. You can also select villa size or choose luxury or budget places. Best all rounder: A gorgeous setting with valley views, lots of space, modern meets rustic charm and a sweeping pool - Villa Buscastells ticks many of the wedding celebration boxes. Best for intimate weddings: A fusion of Ibizan and North African decor influences in the luxury villa Bab al Oued make a great wedding backdrop. This villa allows for up to 20 guests for a special celebration with close friends and family. Close to the clubs: Centrally-located Villa Casa Calma is a beautifully modernised finca that's in the heart of the island, offering fast access to all the super-clubs for when you want to carry on the party. There are many other items you will want to make your big day special. Our Weddings' page has information on professional caterers or reception venues, if you plan to have your sit down meal elsewhere. There is even a delivery service for oysters, the perfect food of love. Whatever villa wedding you want, we feel sure you will find it in Ibiza Spotlight's villa section. A toast to you!